This example shows how to setup the keywords for FRF computation. A nodal force excitation is defined. Frequency dependent response amplitudes at nodes are computed. Differences between constant and mode dependent modal damping can be studied. Example 4.1 from LS-Dyna training class NVH, Fatigue and Frequency Domain Analysis with LS-DYNA by Yun Huang. 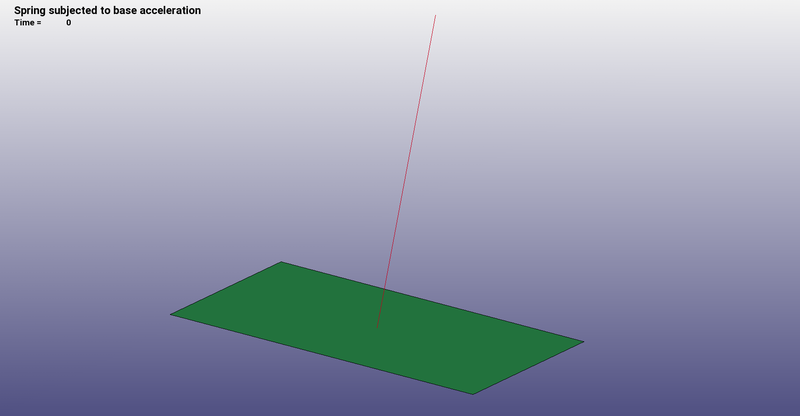 This example shows how to use *FREQUENCY_DOMAIN_FRF for a plate with pressure excitation. Example 4.5 from LS-Dyna training class NVH, Fatigue and Frequency Domain Analysis with LS-DYNA by Yun Huang. 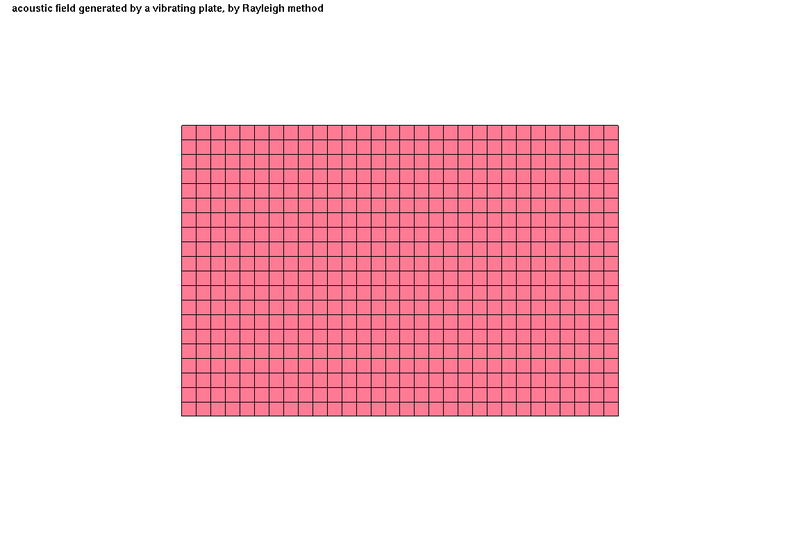 An example of a rectangular plate shows how to set up keywords for steady state dynamic (SSD) problems and how to start post-processing with *DATABASE_FREQUENCY. 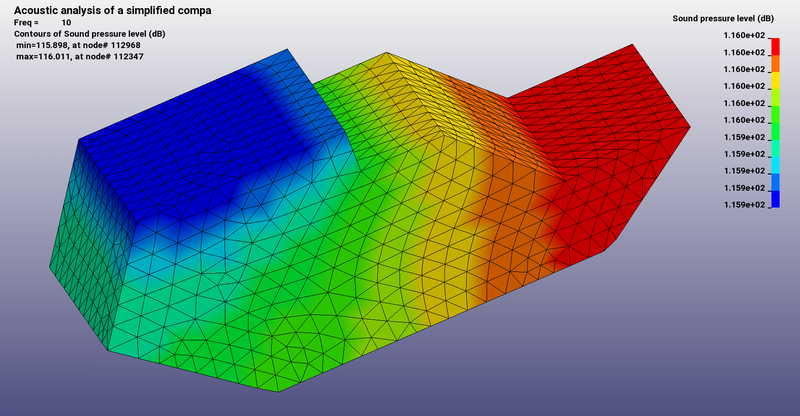 Example 5.1 from LS-Dyna training class NVH, Fatigue and Frequency Domain Analysis with LS-DYNA by Yun Huang. This example shows how to run SSD for an industrial problem. 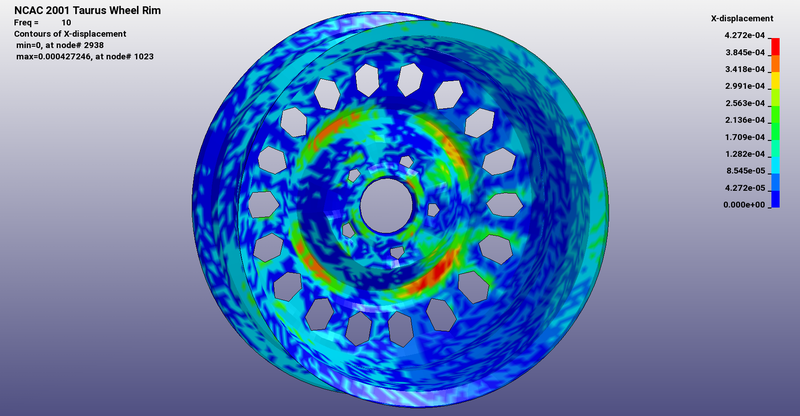 A wheel rim model with base acceleration excitation is analysed. 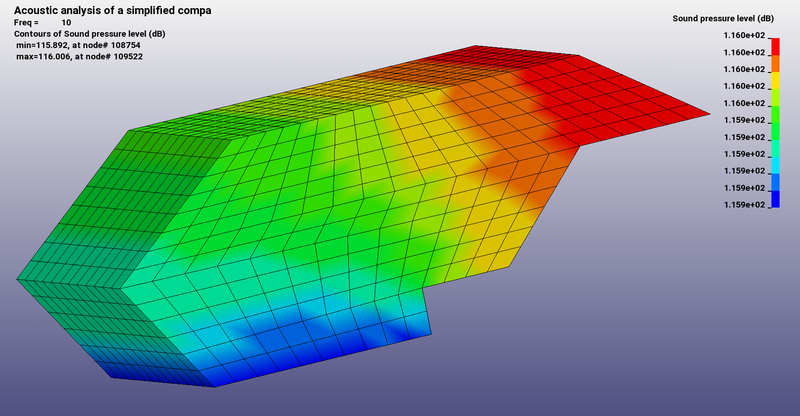 Example 5.3 from LS-DYNA training class NVH, Fatigue and Frequency Domain Analysis with LS-DYNA by Yun Huang. 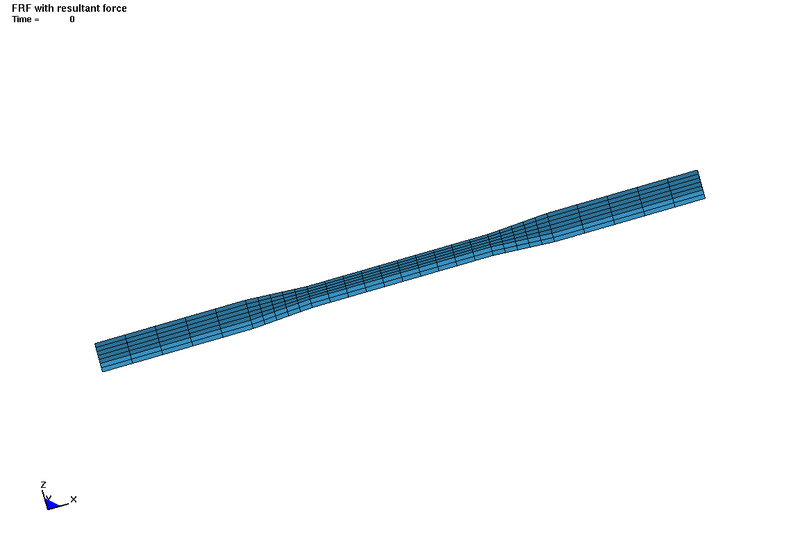 This is a simplified engine model with base acceleration. It shows how to run equivalent radiated power (ERP) problems with *FREQUENCY_DOMAIN_SSD_ERP and how to postprocess with *DATABASE_FREQUENCY_BINARY_D3SSD. Example 5.4 from LS-Dyna training class NVH, Fatigue and Frequency Domain Analysis with LS-DYNA by Yun Huang. 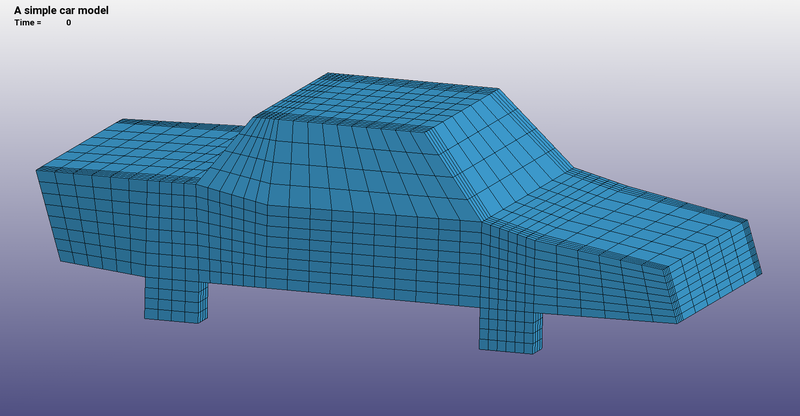 This is a simplified bumper model with base acceleration. It shows how to fatigue analysis for sine sweep testing with *FREQUENCY_DOMAIN_SSD_FATIGUE and how to postprocess with *DATABASE_FREQUENCY_BINARY_D3SSD and *DATABASE_FREQUENCY_BINARY_D3FTG. Example 5.5 from LS-Dyna training class NVH, Fatigue and Frequency Domain Analysis with LS-DYNA by Yun Huang. This is an example of of random vibration with pressure load. 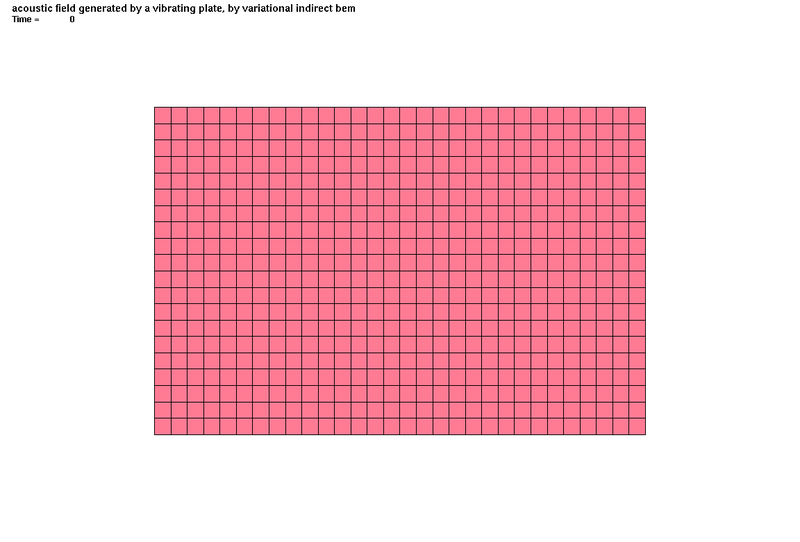 A rectangular plate is subjevted to power spectral density load. *DATABASE_FREQUENCY_ASCII_NODOUT_PSD, *DATABASE_FREQUENCY_ASCII_ELOUT_PSD and *DATABASE_FREQUENCY_BINARY_D3PSD are used for post-processing of the results. 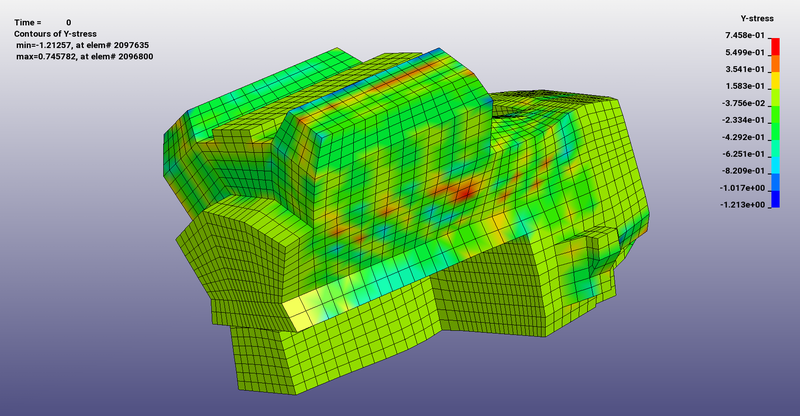 Example 6.1 from LS-Dyna training class NVH, Fatigue and Frequency Domain Analysis with LS-DYNA by Yun Huang. 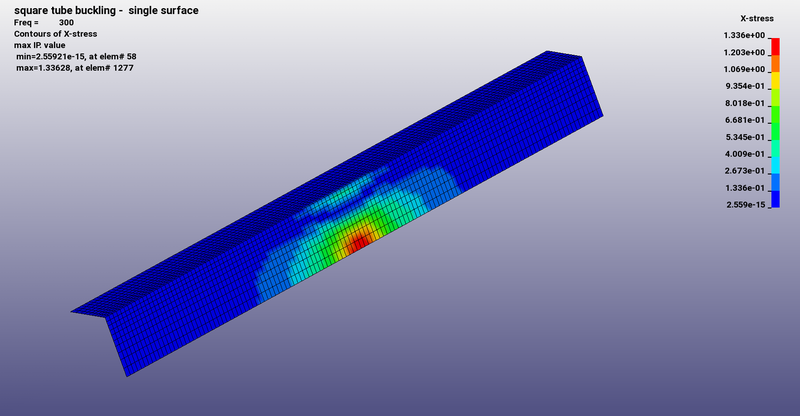 This is a first example of a cantilever beam with concentrated mass subjected to power spectral density. *DATABASE_FREQUENCY_BINARY_D3PSD and *DATABASE_FREQUENCY_BINARY_D3RMS are defined to get output. 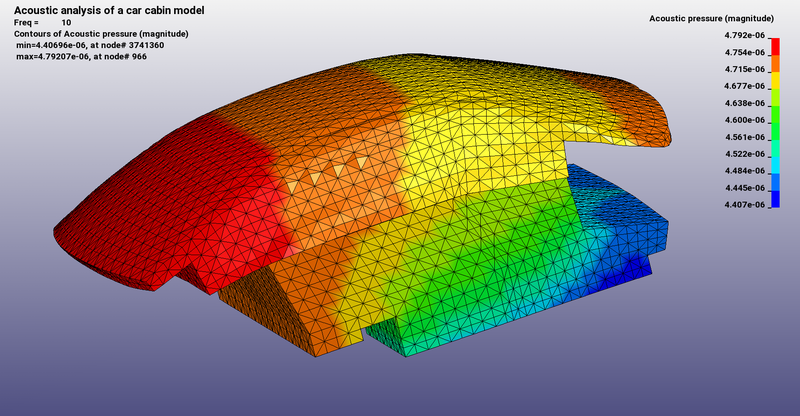 Example 6.2 from LS-Dyna training class NVH, Fatigue and Frequency Domain Analysis with LS-DYNA by Yun Huang. 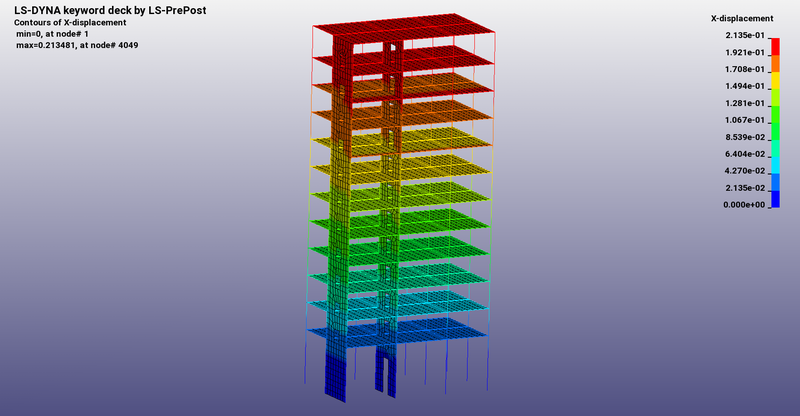 This is a second example of a cantilever beam subjected to power spectral density. Gravity is used for acceleration. *DATABASE_FREQUENCY_BINARY_D3PSD and *DATABASE_FREQUENCY_BINARY_D3RMS are defined to get output. Example 6.3 from LS-Dyna training class NVH, Fatigue and Frequency Domain Analysis with LS-DYNA by Yun Huang. 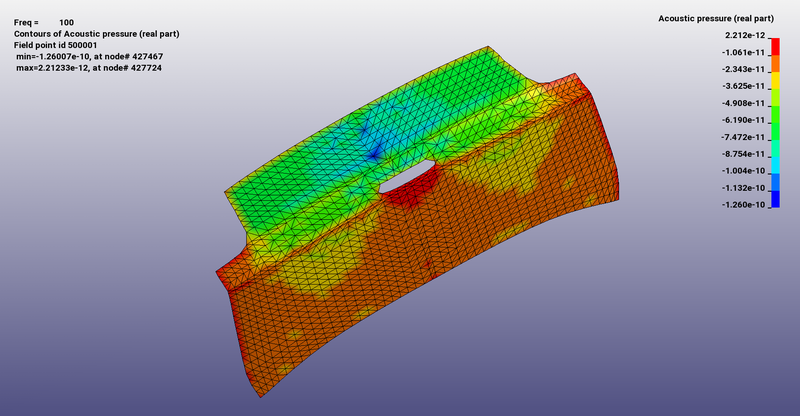 This is an example of a L-shaped panel subjected to random vibration with thermal preload. The first file shows the usual setup without preload. *INTERFACE_SPRINGBACK_LSDYNA is used to create a dynain-file, which is then the basis for pre-stress analysis with *INCLUDE. In addition, usage of intermittent eigenvalue analysis is shown. In the file domgeom.k the domain decomposition can be studied. 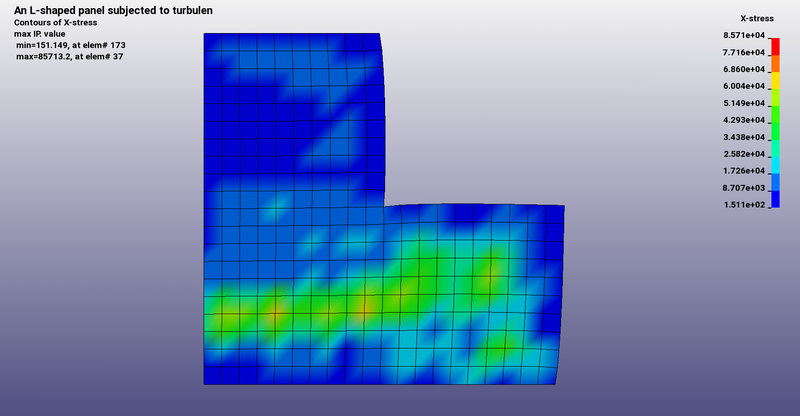 Example 6.4 from LS-Dyna training class NVH, Fatigue and Frequency Domain Analysis with LS-DYNA by Yun Huang. 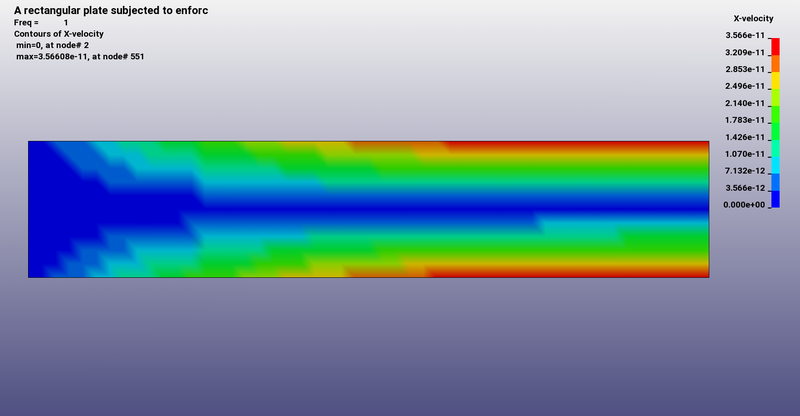 This is an example of a tube model under nodal force power spectral density excitation. *DATABASE_FREQUENCY_BINARY_D3PSD and *DATABASE_FREQUENCY_BINARY_D3RMS are used for post-processing of the results. 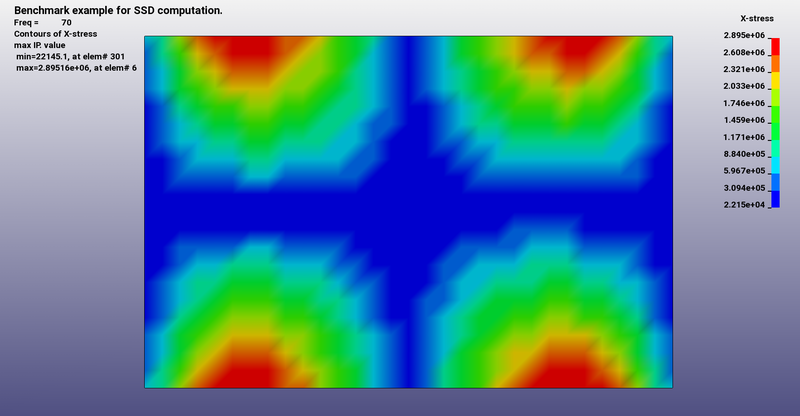 Example 6.6 from LS-Dyna training class NVH, Fatigue and Frequency Domain Analysis with LS-DYNA by Yun Huang. This is an example of a mass-spring model under base acceleration power spectral density excitation. *DATABASE_FREQUENCY_BINARY_D3PSD and *DATABASE_FREQUENCY_BINARY_D3RMS are used for post-processing of the results. 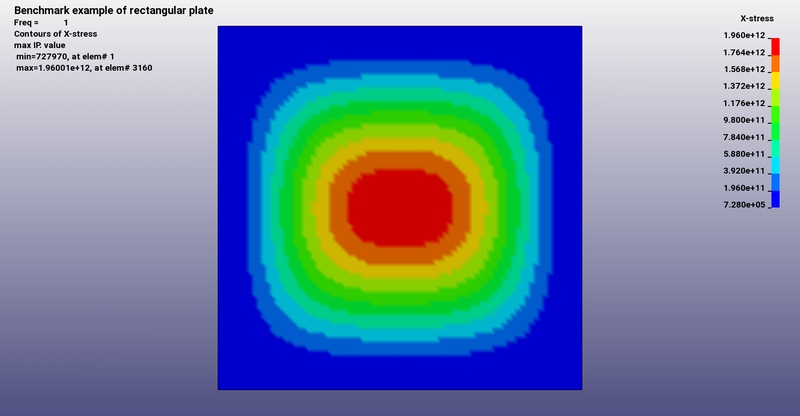 Example 6.7 from LS-Dyna training class NVH, Fatigue and Frequency Domain Analysis with LS-DYNA by Yun Huang. 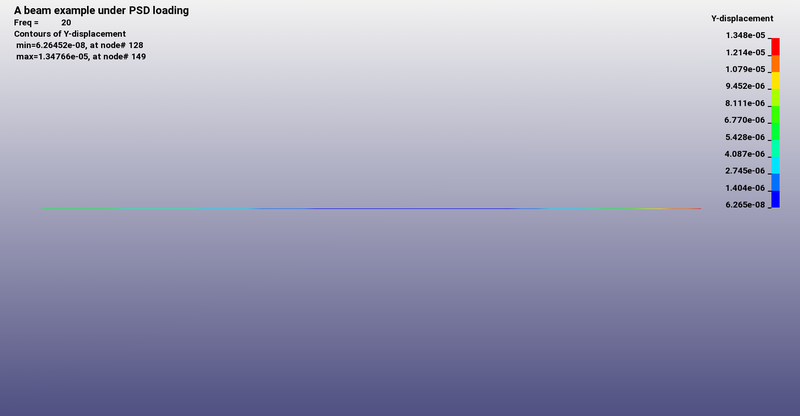 This is an example of a L-shaped panel subjected to multiple nodal force power spectral density excitation. *DATABASE_FREQUENCY_BINARY_D3PSD and *DATABASE_FREQUENCY_BINARY_D3RMS are used for post-processing of the results. The effect of correlated and uncorrelated excitations can be compared. Example 6.8 from LS-Dyna training class NVH, Fatigue and Frequency Domain Analysis with LS-DYNA by Yun Huang. 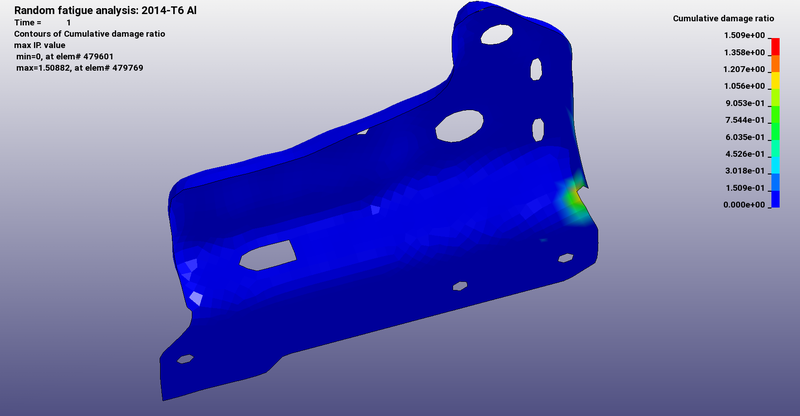 This is an example of an aluminium bracket subjected to base excitation. 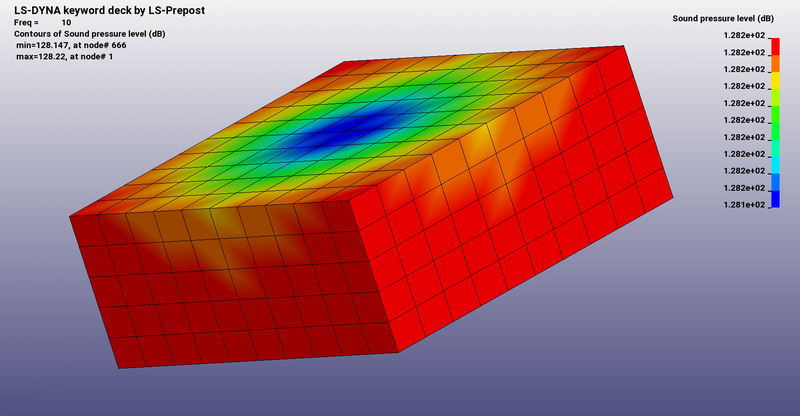 Random fatigue analysis is running with *FREQUENCY_DOMAIN_RANDOM_VIBRATION_FATIGUE using Steinberg's three band method. *DATABASE_FREQUENCY_BINARY_D3FTG, *DATABASE_FREQUENCY_BINARY_D3PSD and *DATABASE_FREQUENCY_BINARY_D3RMS are used for post-processing of the results. 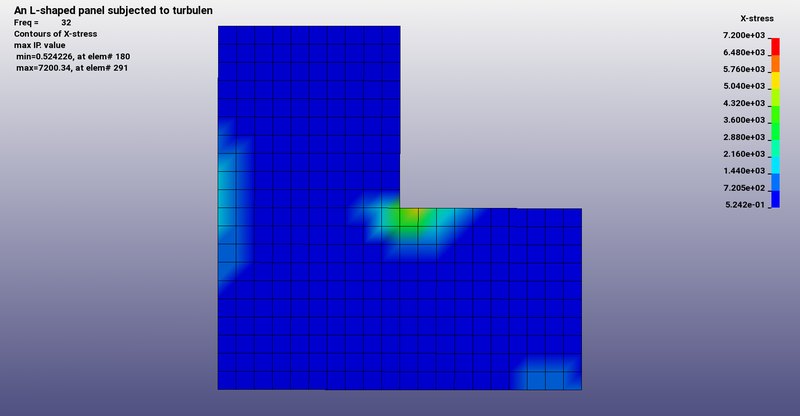 Example 7.1 from LS-Dyna training class NVH, Fatigue and Frequency Domain Analysis with LS-DYNA by Yun Huang. 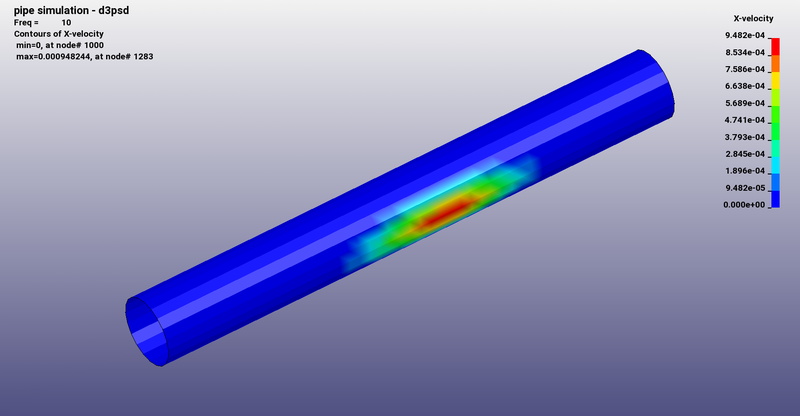 This is an example of an aluminium beam with pre-determined notch subjected to base acceleration excitation. 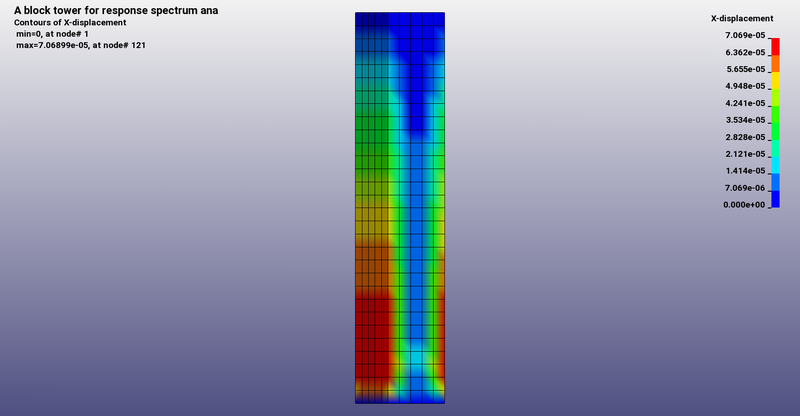 Random fatigue analysis is running with *FREQUENCY_DOMAIN_RANDOM_VIBRATION_FATIGUE using Dirlik's method. *DATABASE_FREQUENCY_BINARY_D3FTG, *DATABASE_FREQUENCY_BINARY_D3PSD and *DATABASE_FREQUENCY_BINARY_D3RMS are used for post-processing of the results. 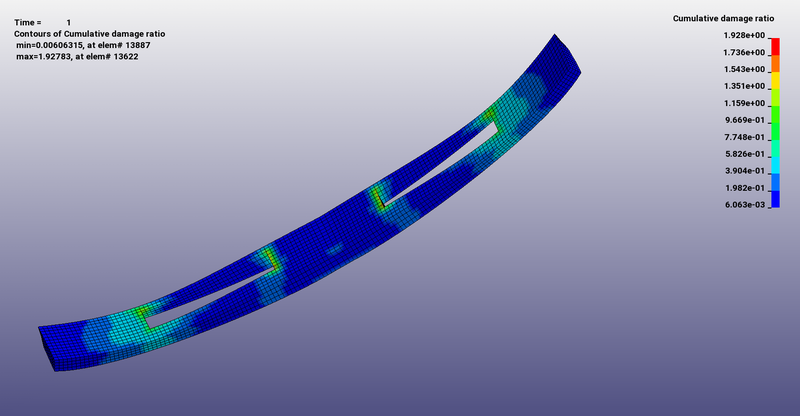 Example 7.2 from LS-Dyna training class NVH, Fatigue and Frequency Domain Analysis with LS-DYNA by Yun Huang. This is a first example of a recangular plate subjected to nodal force excitation. 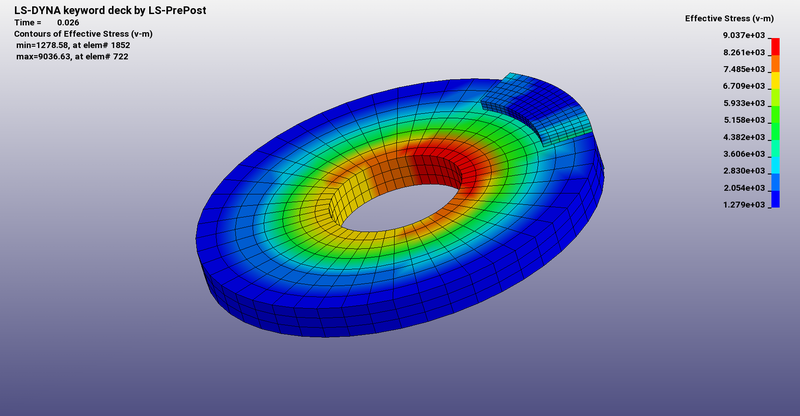 *FREQUENCY_DOMAIN_ACOUSTIC_BEM is used for running a vibro-acoustic problem with variational indirect BEM. In the file domgeom.k the domain decomposition can be studied. Example 8.1 from LS-Dyna training class NVH, Fatigue and Frequency Domain Analysis with LS-DYNA by Yun Huang. 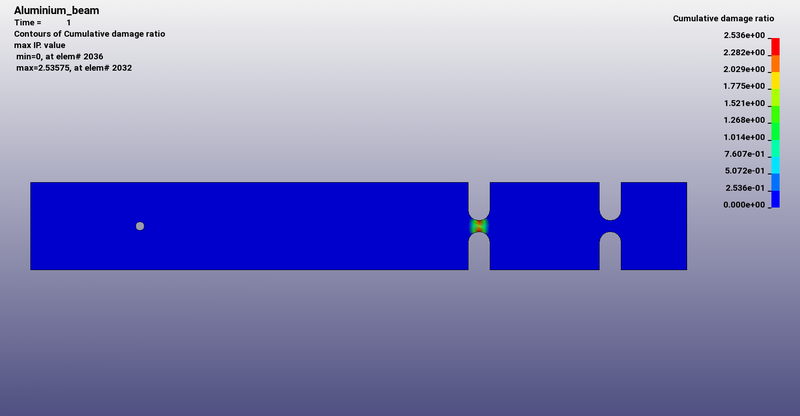 This is a third example of a recangular plate subjected to nodal force excitation. 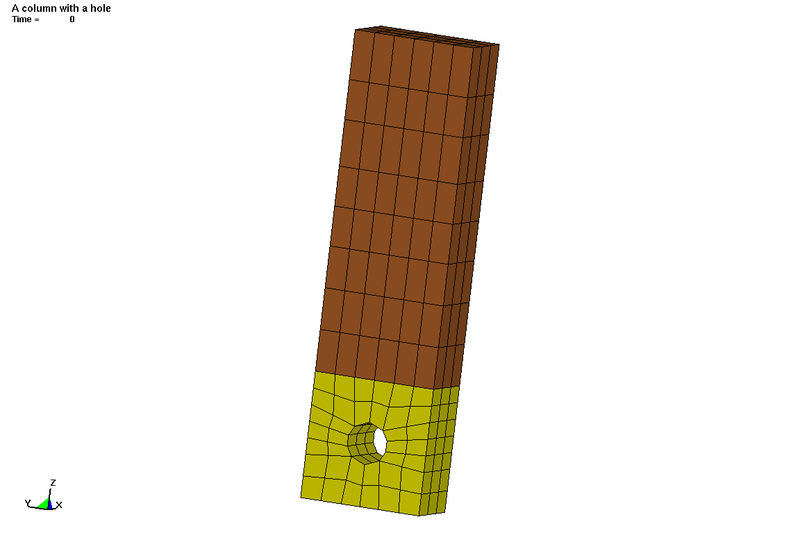 *FREQUENCY_DOMAIN_ACOUSTIC_BEM is used for running a vibro-acoustic problem with Kirchhoff Method. Example 8.3 from LS-Dyna training class NVH, Fatigue and Frequency Domain Analysis with LS-DYNA by Yun Huang. A rectangular beam is subjected to frequency domain acceleration. 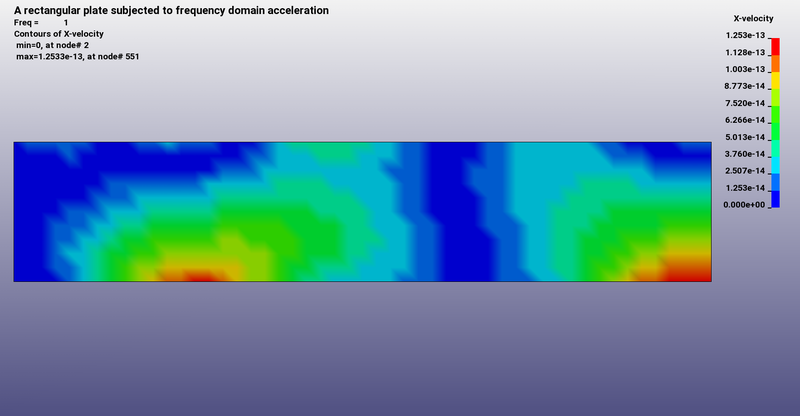 BEM acoustic analysis is coupled with SSD excitation via *FREQUENCY_DOMAIN_SSD. *FREQUENCY_DOMAIN_ACOUSTIC_BEM uses variational indirect BEM and raised cosine windowing technique for FFT. In the file domgeom.k the domain decomposition can be studied. Example 8.4 from LS-Dyna training class NVH, Fatigue and Frequency Domain Analysis with LS-DYNA by Yun Huang. An example of a box shows how to set up an impedance condition. Collocation BEM with different boundary conditions is used Example 8.8 from LS-Dyna training class NVH, Fatigue and Frequency Domain Analysis with LS-DYNA by Yun Huang. 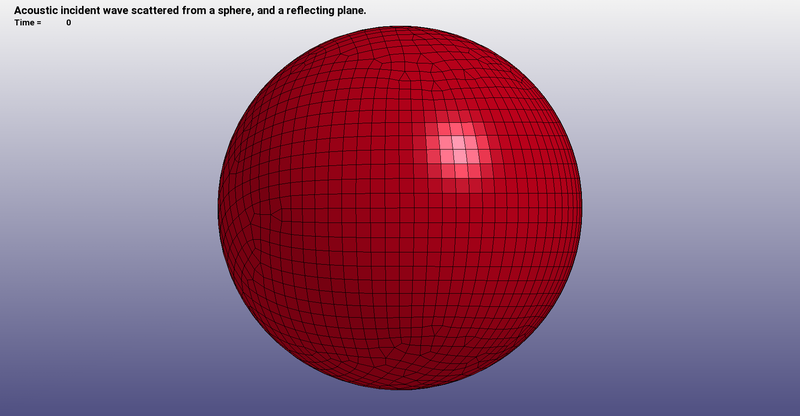 This example of a pulsating sphere in half-space shows how to set up reflection conditions with *FREQUENCY_DOMAIN_ACOUSTIC_BEM_HALF_SPACE. In the files domgeom.k the domain decompositions can be studied. Example 8.9 from LS-Dyna training class NVH, Fatigue and Frequency Domain Analysis with LS-DYNA by Yun Huang. This example shows how to set up an modal acoustic transfer vector (MATV) computation with *FREQUENCY_DOMAIN_ACOUSTIC_BEM_MATV and how to run several loading cases on SSD with *CASE. 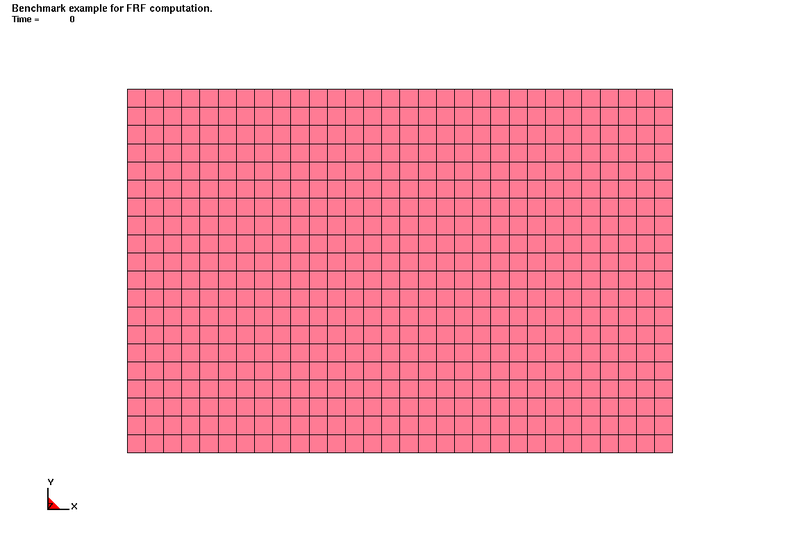 Post-processing is done with *DATABASE_FREQUENCY_BINARY_D3SSD. Example 8.11 from LS-Dyna training class NVH, Fatigue and Frequency Domain Analysis with LS-DYNA by Yun Huang. 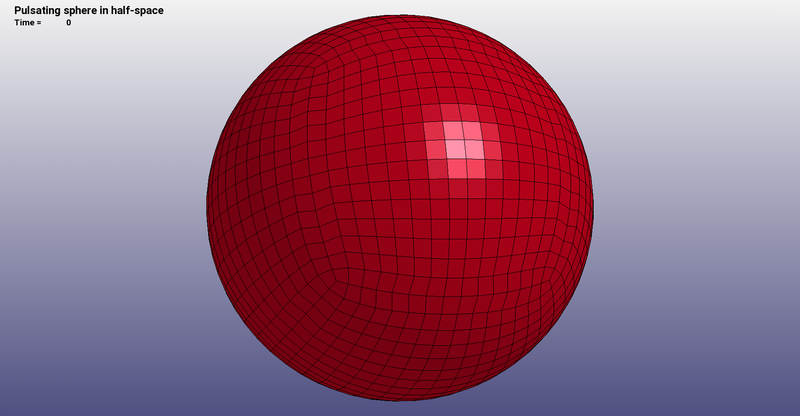 An example of acoustic pressure scattered from a rigid spherical surface shows how to solve acoustiv scattering problems with *FREQUENCY_DOMAIN_ACOUSTIC_BEM and *FREQUENCY_DOMAIN_ACOUSTIC_INCIDENT_WAVE. Example 8.12 from LS-Dyna training class NVH, Fatigue and Frequency Domain Analysis with LS-DYNA by Yun Huang. 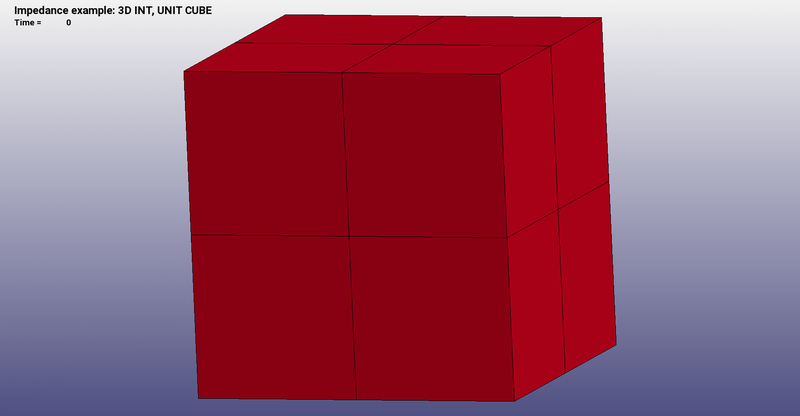 This is an example of a simplified compartment model with hexaeder elements and velocity boundary conditions. It is shown how to set up a model for frequency domain FEM acoustics with *FREQUENCY_DOMAIN_ACOUSTIC_FEM and how to post-process with *DATABASE_FREQUENCY_BINARY_D3ACS. 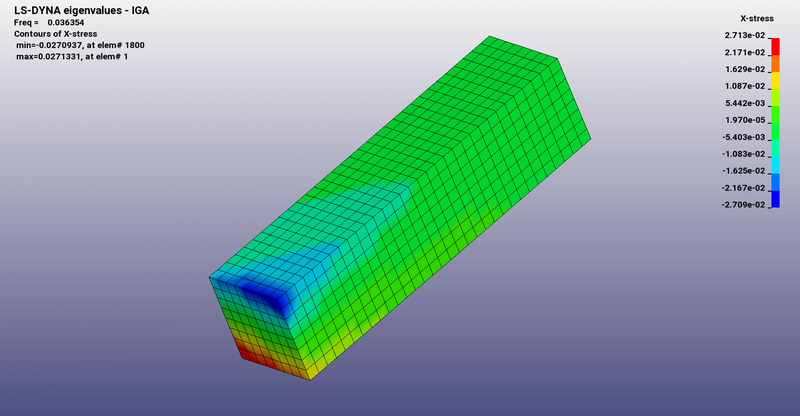 Results can be compared with the example ''BEM acoustics of a simplified compartment model''. Example 9.1 from LS-Dyna training class NVH, Fatigue and Frequency Domain Analysis with LS-DYNA by Yun Huang. This is an example of a simplified compartment model with tetrahedal elements. It is shown how to set up a model for frequency domain FEM acoustics with *FREQUENCY_DOMAIN_ACOUSTIC_FEM and how to post-process with *DATABASE_FREQUENCY_BINARY_D3ACS. Results can be compared with the example ''BEM acoustics of a simplified compartment model'' and ''FEM acoustics of a simplified compartment model I''. Example 9.2 from LS-Dyna training class NVH, Fatigue and Frequency Domain Analysis with LS-DYNA by Yun Huang. 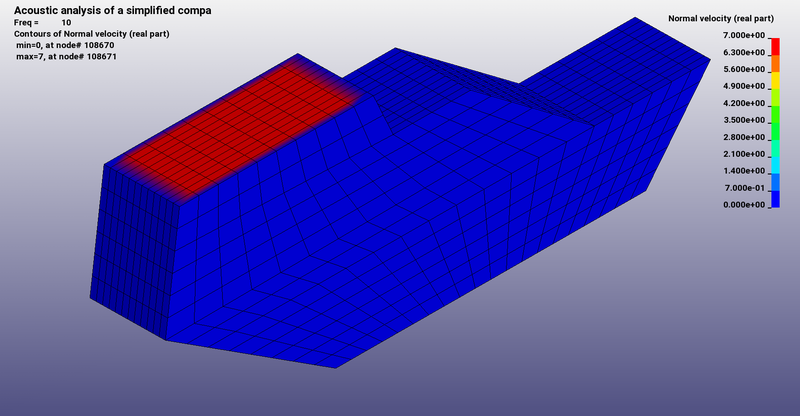 This is a simple box model to show how to couple FEM acoustics with steady state dynamics (SSD). Example 9.3 from LS-Dyna training class NVH, Fatigue and Frequency Domain Analysis with LS-DYNA by Yun Huang. 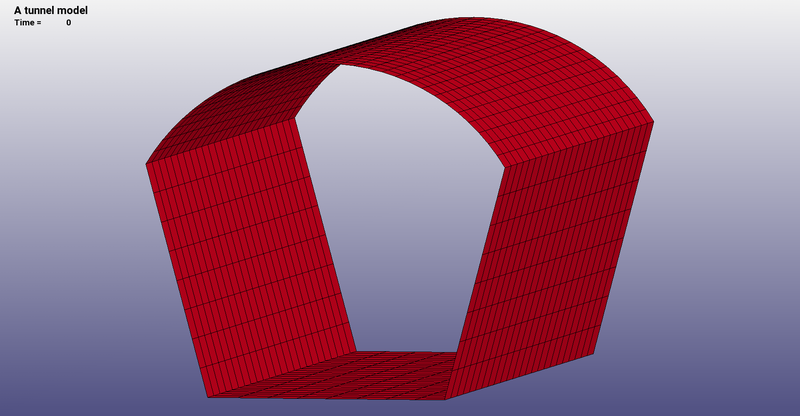 A simple cabin model with seats shows how to set up multiple boundary conditions and how to define impedance boundary conditions. Example 9.4 from LS-Dyna training class NVH, Fatigue and Frequency Domain Analysis with LS-DYNA by Yun Huang. This example shows how to set up a simple brick tower model to run resonse spectrum analysis with *FREQUENCY_DOMAIN_RESPONSE_SPECTRUM. *DEFINE_CURVE and *DEFINE_TABLE are used to define ground acceleration spectra for different damping coefficients. Post-processing is done with *DATABASE_FREQUENCY_BINARY_D3SPCM. 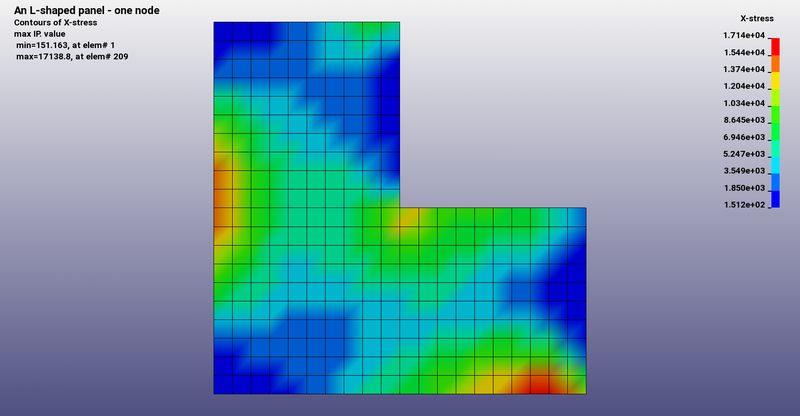 Example 10.1 from LS-Dyna training class NVH, Fatigue and Frequency Domain Analysis with LS-DYNA by Yun Huang. This is a simple break example to show how to set up break squeal problems. A multi-step method with intermittent eigenvalue analysis using *CONTACT_AUTOMATIC_SURFACE_TO_SURFACE_MORTAR_ID, *CONTROL_IMPLICIT_EIGENVALUE, *CONTROL_IMPLICIT_ROTATIONAL_DYNAMICS and *CONTROL_IMPLICIT_SOLVER is presented. Example 11.1 from LS-Dyna training class NVH, Fatigue and Frequency Domain Analysis with LS-DYNA by Yun Huang. 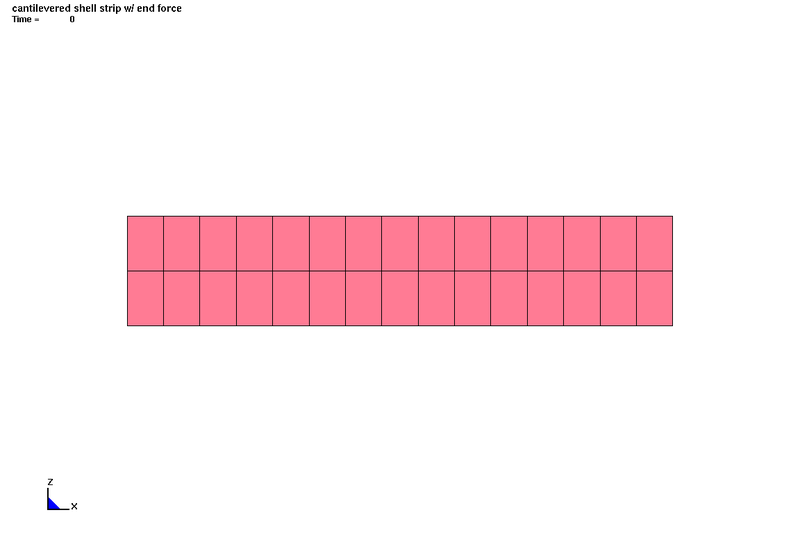 This is an example for running problems with IGA. 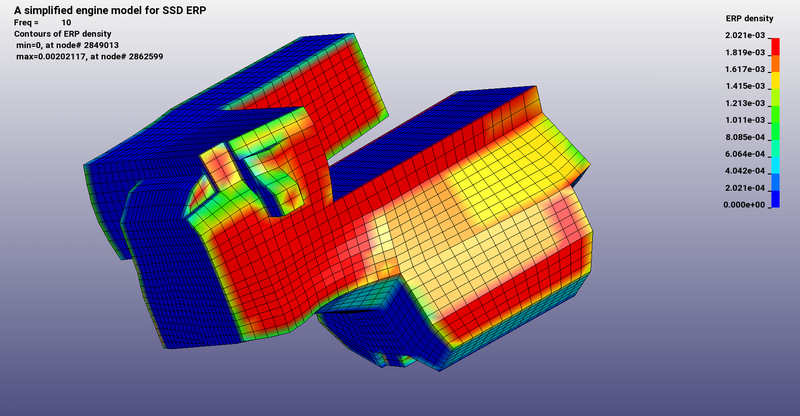 Results can be compared with classical FEA. Examples 11.5-11.6 from LS-Dyna training class NVH, Fatigue and Frequency Domain Analysis with LS-DYNA by Yun Huang.